Historic Henhouse: What Was Chicken Nutrition Like Before Bagged Feed? Books from a century ago advocate feeding chickens modern-day favorites such as greens, grains, hard-boiled eggs and table scraps. 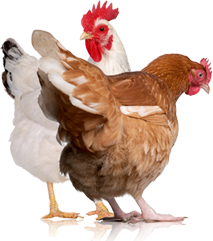 Nutritionally balanced, bagged livestock and poultry feed is a fairly recent and welcome development. 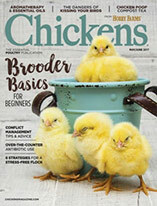 One hundred years ago, poultry keepers grew their own chicken feed or fashioned it from bulk ingredients. Consider chick starter. In 1909, Arthur Johnson wrote Chickens and How to Raise Them, in which he stressed how important chicks’ first meals are to give them a healthy start. In a couple of hours or so, Johnson said, another meal may be given. The next day, the chicken keeper could add some coarse oatmeal to the mixture. Green food was highly regarded in the day and is still a valuable addition to the fare of our chickens, be they chicks, layers or slow-growing heritage meat birds. Johnson couldn’t stress enough the importance of a good supply of fresh, juicy vegetables, particularly in late winter, when there isn’t much green to be found. Myrtle Wilcoxon wrote Common Sense on Poultry Raising in 1906 and heartily agreed. Her favorite chicken feed from the garden was the mangel-wurzel, also known as the mangel or fodder beet, an astoundingly productive, easy-to-grow, old-time vegetable still right for today’s poultry garden. A single root weighs as much as 20 pounds, and mangels keep well in winter storage. To feed the beets, Wilcoxon advised splitting the root lengthwise with a large knife. The chickens can then pick out the crisp, fresh food from the exposed cut surface. Large pieces have the advantage over smaller pieces in this respect: The smaller pieces when fed from troughs or dishes are thrown into the litter and soiled more or less before being consumed. Large pieces can’t be thrown about as easily and remain clean and fresh until wholly consumed. In addition to green food, turn-of-the-century chickens ate rations comprising grains, protein from milk or meat, and scraps from the family’s table. Field’s preparation included scalding or boiling the table scraps enough to soften them, and then mixing in enough wheat bran to make a stiff, crumbly mass. “For some of the other breakfasts, boil up the small potatoes, apples, turnips, carrots, beets, parsnips, beans, peas, squashes, pumpkins, celery tops, sometimes one thing, sometimes another. Mash them, and then mix up with bran and shorts [wheat middlings] and sometimes a little cornmeal,” she wrote. In The Home Poultry Book (1913), author Edward Farrington described an ideal small-flock feeding plan. Our authors stressed that supplements and plenty of water are important, too. “Only the veriest tyro [beginner] needs to be told that oyster shells and grit must be kept in hoppers where the hens can have access to them at all times,” Farrington wrote. He also noted that without water, hens will not lay eggs. During summer, he advised providing fresh water at least twice a day. “It is an advantage to have the water dish in a shaded place outside the house and an iron or earthenware dish will help to keep the water palatable,” he wrote. Field addressed winter water for hens in the same way she addresses feeding: directly, and with her chickens’ welfare in mind. During cold weather, Field suggested keeping a supply of pure, fresh water available to your flock during the greater part of the day. And be sure it’s a bit warm. “Warm drink and warm food makes the fowls feel comfortable,” she wrote. Vintage poultry books are filled with interesting, often adaptable old-time feeding advice. Download a few from the Heritage Biodiversity Library or buy reprints from today’s booksellers. They are fun to read and informative, too. All the vintage poultry books we discuss in this column are available from the Biodiversity Heritage Library, a consortium of libraries dedicated to making digital a huge array of old-time natural history and agricultural books and journals so they’re available as free downloads to anyone who wants to read them. 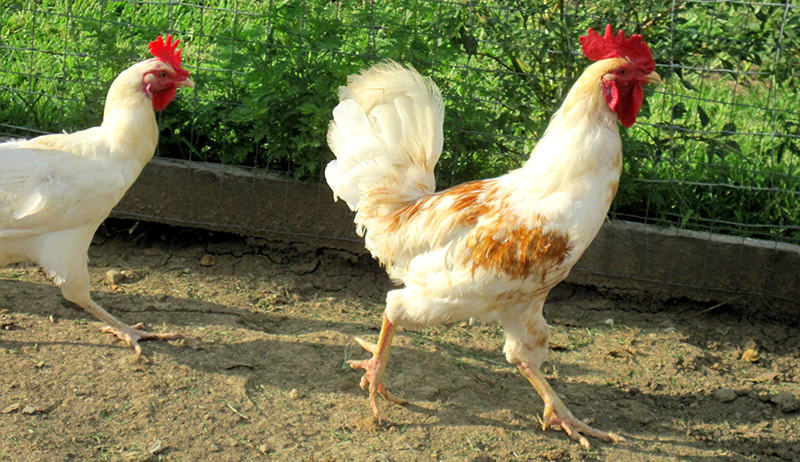 More than 200,000 titles are available, including more than 50 general-interest poultry books, and a plethora of books just about chickens including breeds and banta/ms, geese, ducks, turkeys and guinea fowl. 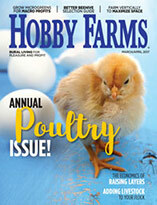 It’s a resource every poultry keeper should have.